Assistant Principal at Mt Ousley PS, NSW Australia with interests in authentic learning and STEM esp. space, robotics, enviro.ed and citizen science. 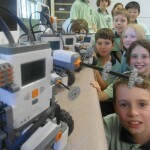 I've been using LEGO NXT in the classroom for years 3-6 problem based learning and enrichment streams. Always learning!